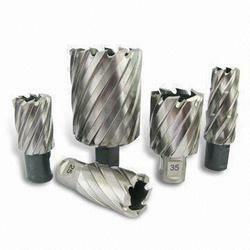 BROACHCUTTER Annular Cutters are made of Special Blended HSS Alloy Steel which results in Edge Sharpness that lasts longer, drilling more holes than standard HSS cutters. Their Multi-Cut geometry improves performance of centering as well as removal of chips. Set of 10 HSS Annular Cutters and 1 pilot pin. To furnish the diverse requirements of our clients in the best possible manner we are involved in offering an extensive range of HSS Annular Cutter. Available in HSS M35 and M42 Grade with cutting edge length 25mm and 50mm. Also available as customer requirement.